1075 1075 0% off in Rs. Surface coating industry is one of the most popular industries. Paints, varnishes and lacquers industry is gaining ground at a rapid pace in modern time accompanied with closed advance in surface coating technology. They are formulated for specific purposes: outside house paints and exterior varnishes are intended to give good service when exposed to weathering; interior wall paints are formulated to give excellent coverage and good wash ability; and lacquers are formulated for rapid drying. Varnish is one of the important parts of surface coating industry. Varnish is a transparent, hard, protective finish or film primarily used in wood finishing but also for other materials. They are used to change the surface gloss, making the surface more matte or higher gloss, or to provide the various areas of a painting with a more unified finish. Varnishes are also applied over wood stains as a final step to achieve a film for gloss and protection. Some products are marketed as a combined stain and varnish. Paint is any liquid, liquefiable, or mastic composition which after application to a substrate in a thin layer is converted to an opaque solid film. It is most commonly used to protect, colour or provide texture to objects. The paint industry volume in India has been growing at 15% per annum for quite some years now. As far as the future growth prospects are concerned, the industry is expected to grow at 12 to 13% annually over the next five years. The technology is required to produce different type of new paints and varnishes based on different type of uses. The paint and coatings industry plays an integral role in sustainability; coatings protect the objects we depend on every day, preserve our possessions, so they last longer and provide for a sustainable future. They are indispensable products that extend the useful life of everyday objects by acting as a protective barrier. These newer products have enabled paint manufacturers to improve the performance properties of their paints and coatings and so satisfy the more stringent requirements of our modern industrial society. The future for industrial paints, varnishes and lacquers is bright. In the next few years its value will go up gradually in line with the global trend. The major contents of the book are application of paints, fundamentals of paint, varnishes and lacquers, manufacturing of different type of paints, paint formulation, pigment dispersion, emulsion paints, and so on. The book deals with fundamentals of paints, Varnishes and lacquers, pigments, Oils used in paints and varnishes, solvents, dryers, plasticizers, additives for surface coating, various types of paint manufacturing etc. The book is very useful for new entrepreneurs, existing units, technocrats, technical institutions and for those who wants to diversify in the field of paints manufacturing. Melt 15 lbs. Of cent per pure Manila gum on fire. Then add 1 gallon superior quality of linseed oil heated to 400Â°C. Now remove it from fire and let is cool. To this cold mixture then add 3.5 gallons of terpentine oil. To every gallon of the above mixture add 8 lbs. Zinc oxide crystals of good quality well grinded in paper varnish. To prepare this varnish 2 lbs. of damar is dissolved in half gallon cold terpentine oil. Kauri resin is melted on coal fire. 15 parts of this melted resin is mixed with 60 parts of turpentine oil and filtered. To this is added 25 parts of boiled and cooled linseed oil. Varnish prepared in this way is used in the preparation of luminous paints. 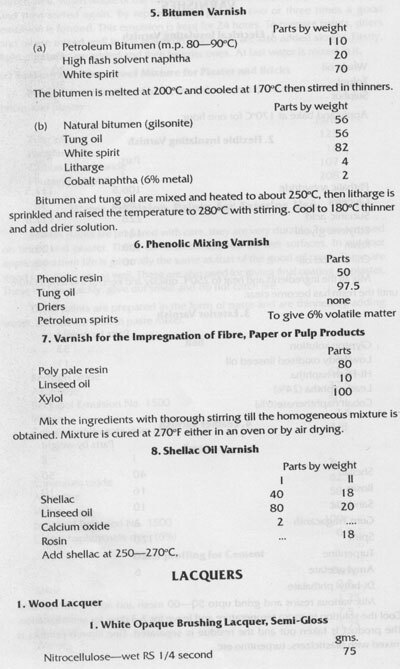 Ordinary varnish available in the market should not be used as it contains lead or manganese which affect its luster. The varnish prepared above is mixed with luminous sulphide of calcium and other gradients are worked well in stone vats into substance made of iron should be used. 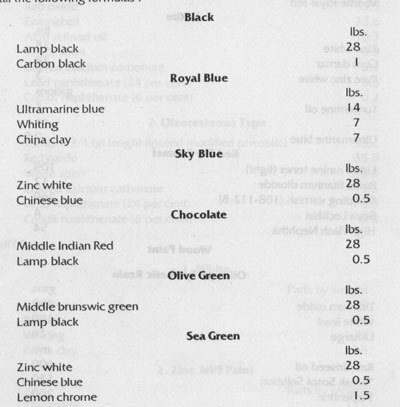 Here are number of formulas for luminous paints of different colours. In these the varnish prepared by above method should be used. 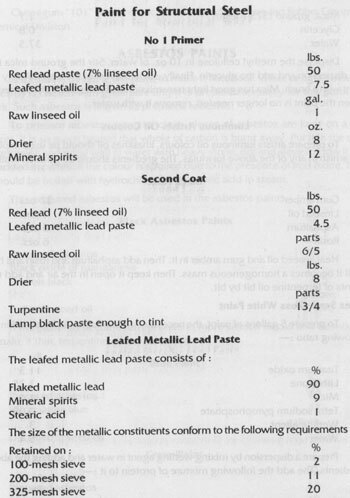 Mix the leafed metallic lead paste thoroughly with one pint of linseed oil. Stir this mixture into red lead paste, until the mixture is smooth and homogeneous. Finally, stir in the remainder of the raw linseed oil, drier and thinner. Allow the finished paint of stand for 24 hours or more before using it. The weight per gallon of this paint must be less than 27 lbs. The formulation described here meets the specifications of the California Highway Department. Disperse the methyl cellulose in 10 oz. Of water. Stir the ground mica into this dispersion and add the glycerin. Finally, stir in the rest of the water. Apply this paint with a brush. Mica has good light transmission and extensive light scattering. When the paint is no longer needed, remove it with water. 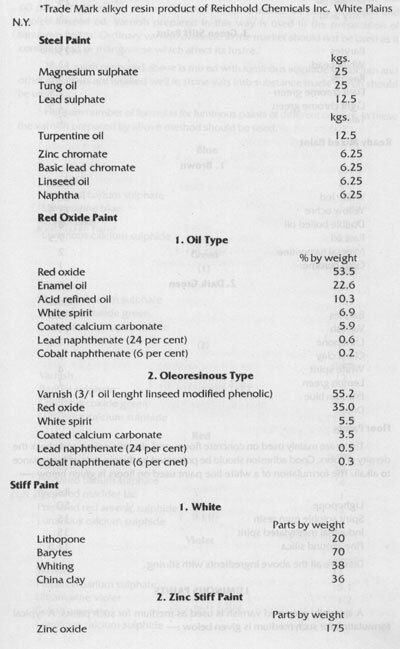 To prepare artists luminous oil colours, khaskhas oil should be used in place of varnish in any of the above formulas. The gradients should be grinded well. To this batch i.e. 4 gallons paint, 17.58 lbs. Chemigum '010' and 5.06 lbs. Water is mixed. Chemigum "101" is a synthetic latex by Good Year Tyre and Rubber Company, Chemical Division. Asbestos is mixed in the paint to make it fire proof. White or light coloured asbestos is chosen with great care and it is prepared specially for this particular work. Such asbestos is known as prepared asbestos. To prepare asbestos selected clean pieces of asbestos are kept on a gas report. It is so much heated that whole of carbon is burnt away. Put it in the cold water, wash and grind well in water with heavy stone, dry and sieve it. How it can be added in paints. If the colour is spoiled due to the presence of iron oxide, then it should be boiled with hydrochloric or sulphuric acid in steam. This prepared asbestos will be used in the asbestos paints. Wetted gum Arabic and gelatin overnight and then dissolve by heating water jackedted kettle. The add chemicals in it. Thereafter its oily part is made by dissolving Copal ester in linseed oil. Varnish is heated upto 200Â° F, water is added to it and stirred well. When whole of the varnish dissolves, the batch is kept for some time and then stirred again. By repeating this process two or three times a good emulsion is formed. This emulsion is kept for 24 hours. 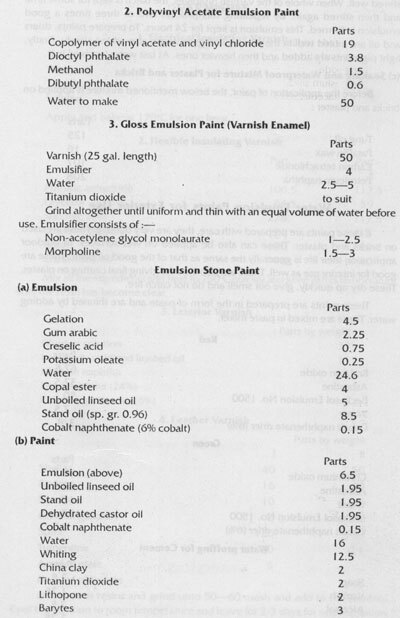 To prepare paints, dries and oil are mixed well in the emulsion. Pigments are also added slowly. Firstly, light pigments are added and then heavier ones. At last water is mixed in it. If these paints are prepared with care, they are very durable. These are used on bricks and plaster. These can also be applied on wet surfaces. In outdoor application their life is generally the same as that of the good oil paint. These are good for interior use as well. These are also used for giving final coating on plaster. These dry up quickly, give out smell and do not catch fire. These paints are prepared in the form of paste and are thinned by adding water. These are mixed in paste mixer. Mix various resins and grind upto 50-60 mesh and add to the solvents. Cool the solution to room temperature and leave for 2-3 days for sedimentation. The product is taken out and the residue is separated. Fine filtered product is mixed with plasticizers, turpentine etc. Lacquers prepared from cellulose esters and ethers are generally termed as cellulose lacquers. These products are obtained not only from cellulose but thinners or diluents are used to correct the consistency and lessen the expenses of the solutions, resins increase the adhesiveness and luster and plasticisers are mixed to produce the necessary elasticity. Cellulose nitrate is the main constituent and forms the main part of film. To prepare lacquers of good quality the use of cellulose nitrate of proper grade is a must. 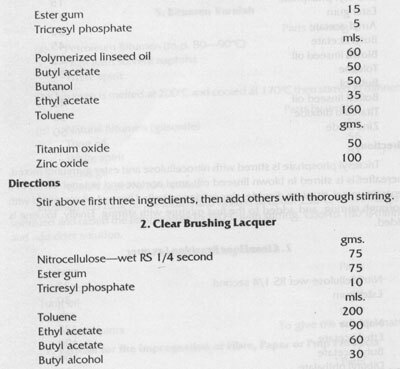 To prepare high class lacquers, esters prepared from a special method should be used. The products are obtained by the used old films. Miscible in nitro cellulose in all proportion and is mixed in it to lessen its inflammability and increase its elasticity. This is generally used in those lacquers, whose films is to be kept very elastic like lacquers for metals and for application on cables. 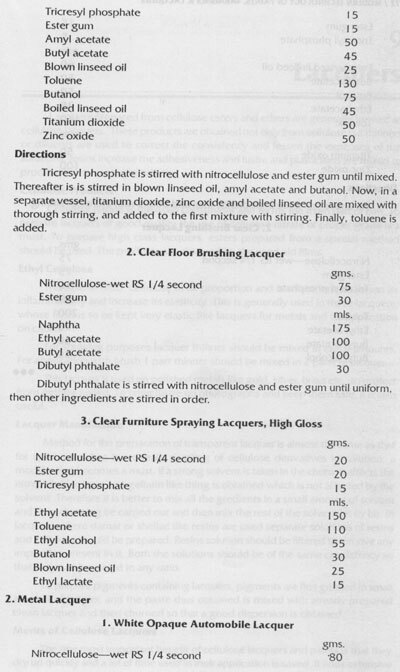 For spraying purposes lacquer thinner should be mixed in equal amounts. For application with brush 1 part thinner should be mixed in 2 parts of lacquer. 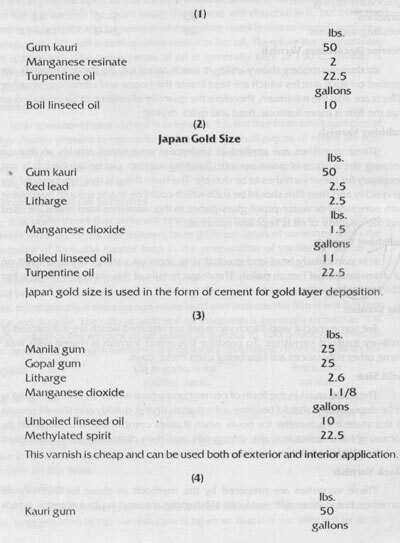 This lacquer is used on polished metals like gold, silver, brass etc. to protect from getting rusted. To bring luster on photographs and keep them safe, it is also useful. Method for the preparation of transparent lacquer is almost the same as that for spirit varnishes but due to swelling of cellulose derivatives in solution, a modification becomes a must. If a strong solvent is taken in the churn, it affects the nitrocellulose layer and gelatin like thing is obtained which is not affected by the solvent. Therefore it is better to mix all the gradients in a small amount of solvent and then churning be carried out and then mix the rest of the solvent bit by bit. In lacquers where damar or shellac like resins are used separate solutions of resins and cellulose should be prepared. Resins solution should be filtered to remove any impurities present in it. Both the solutions should be of the same consistency so that they can be mixed in any ratio. To prepare pigments containing lacquers, pigments are first grinded in small amount of thinner, and the paste thus obtained is mixed with already prepared clean lacquer and then churned so that a good dispersion is obtained. The one most important benefit of cellulose lacquers and paints is that they dry up quickly and a lot of time used in their application is saved. It finds extensive use in the preparation of painted things like motors, cars, furniture etc. These lacquers are sprayed. As these dry up very quickly, therefore are not applied with brush. The film of cellulose lacquer besides being elastic, is rubbing and scratch resistant. It is not affected by moisture and solvents like dilute acids, alkalies, alcohol and petrol have mild effect. The field of the use of cellulose esters is quite vast. These are mostly used in painting cars and other mechanical vehicles. Then a good quantity of these is used on furniture. Cheap quality of cellulose lacquers are applied on toys where luster and colour is more important than durability. Besides others, these are also used in the preparation of artificial leather. Dissolve the colours in alcohol, mix butyl acetate and then add metal lacquer. Metal lacquer should be based upon nitrocellulose. 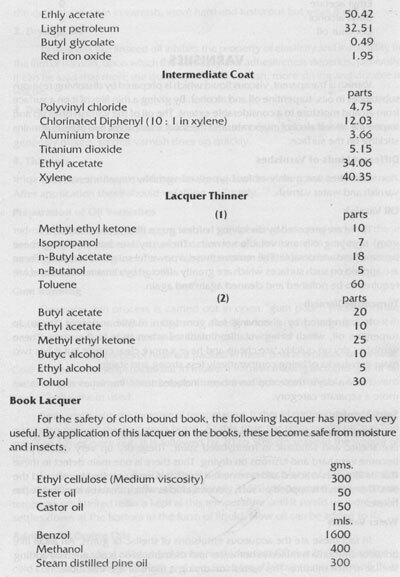 2 gallons lacquer is obtained from the above formula. By application of this lacquer on steel sheets, they look like brass or gold. 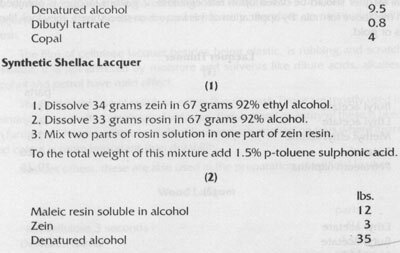 Dissolve with the help of mixer at room temperature. Resin should be added in small piece and then dissolve. 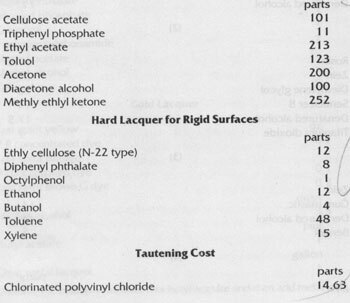 About 7 gallons of lacquer is obtained by this formula. This lacquer is used on such surface where up till now only shellac was being used. IT dries up quickly and is very hard. Varnish is transparent, viscous liquid which is prepared by dissolving resinous substances in oils, turpentine oil and alcohol. By giving a thin film of it on a surface from air and moisture to a considerable extent. The oil of the varnish dries up and turpentine oil and alcohol evaporate, and the solid, transparent film of resin remains sticking on the surface. Varnish are mainly of four types; oil varnish, turpentine varnish, spirit varnish and water varnish. These are prepared by dissolving hardest gums (like copal, animi and amber gum) in drying oils and volatile solvents. These dry late but on drying these become hard and durable. The remove these, a powerful solvent is required. These are applied on such surfaces which are greatly affected by climatic effects and are required to be polished and cleaned again and again. It is prepared by dissolving soft (gum mastic and gum damar) in turpentine oil, which being volatile, volatilizes when kept in the open. These varnishes dry up quickly, are cheap and have a more clear colour but it has two main drawbacks of being comparatively less strong and stable. Now-a-days, these too have been included in oil varnishes and form no more a separate category. These are also known as lacquers and are prepared by dissolving soft gums like shellac and sandarac in methylated spirit. These dry up very quickly and become very hard and lustrous on drying. Thus there is on main defect in these that its film gets cracked and is removed itself. It is easily spoiled by rain and the sun. Therefore, it is applied on such wooden articles which are to be kept inside the house. In fact these are the acqueous emulsions of shellac or gums. An alkali like borax or ammonia is mixed in hot water and then emulsion is obtained by adding shellac in their mixture. This varnish on drying is more or less insoluble. Resins, form hard and lustrous film on drying. Generally it is said that more the quantity of resin in varnish, more hard and lustorous but weak it will be. 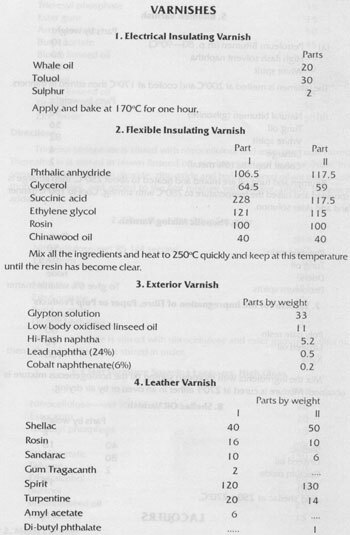 Drying oils like linseed oil inhibits the property of elasticity and insolubility in the film of varnish, upon which the durabilityl and adhesiveness depends. Generally it can be said that more the quantity of oil in varnish, more strong and durable it will be. 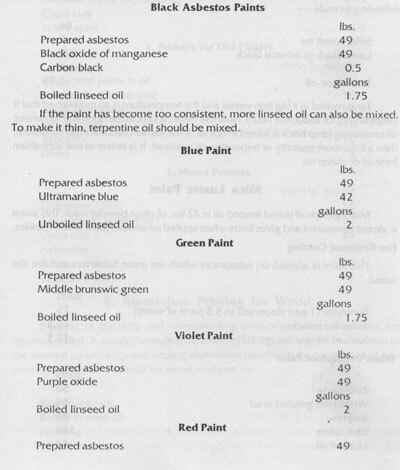 These are the liquids which affect the rate of drying of varnishes. Dryers are generally mixed, so that varnish dries up quickly. To prepare oil varnish resins are first sorted out and cleaned and then these are broken into piece of equal size. Some hard resins are to undergo "gum running" before being used for varnish preparation. By this process, these become fit for dissolution into drying oils. Generally thin process is carried out in open "gum pots". These pots are usually 40.5" high and 20.5" in diameter and 60 pounds resin can be fed into it in one operation. Pots of sizes smaller than these can also be used. Small broken pieces of resin are packed in these pots and placed on furnace. Coal is used in these furnaces but in modern varnish making factories gas or oil fuel is used because with these temperature can easily be controlled. In coke ovens coal or soft coke in used. Resin melts with the increase of temperature. It should continuously be stirred, otherwise resin at the bottom is burnt. As this time the resin swells up and bad smelling fumes ooze out. It is followed by 20 to 30% decrease in the weight of resin. For the proper doing of this process, thermometer is a must. Different resins require different quantity of heat but generally 315Â°C temperature is the optimum temperature. Melted resin is kept at this temperature until it swells no more and it settles down at the bottom in the form of liquid. Now oil can be added to it. Already purified oil is added to the melted resins. Oil should not be added in cold condition. Resin gets brittle and requires a lot of labour to mix in the oil. That is why oil is firstly heated to 250Â°C. Oil is heated in big vat and then the hot oil is mixed in a number of pots containing melted resin. 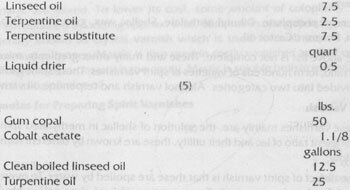 To adjust the rate of drying of the oils, upon which the rate of drying of varnish depends, it is necessary to add a drier. If in organic compound like lead or manganese is to be added, it should be added first in hot oil and then this oil should be mixed in the melted resin. If more soluble first in hot oil and then this oil should be mixed in the melted resin. If more soluble drier like lead linoleate is to be added then it is not necessary to mix at this time, but should be dissolved just before diluting the varnish. Hot oil is added to the melted resins in small amounts with constant stirring and keeping the temperature low than before. This mixture is kept at 200 to 260Â°C temperature for a time, until resin and oil mix with one another completely and becomes a homogeneous mass. To test whether these have mixed together or not, a test portion of it is taken in a pot and kept for some time. It should be clear and transparent on cooling, otherwise it has not mixed up completely. If these are not mixed completely, resin and varnish will separate from each other or other defects will be produced on keeping the varnish for a couple of days. When the boiling process for varnish is complete, the kettle is removed from oven and kept in the open so that thinners could be mixed to lessen its consistency. More hot the varnish the more easily the thinner will dissolve in it, but both the thinners, white spirit and turpentine oil evaporate quickly due to heat. Therefore a good quantity of it will volatilize when mixed in hot oil. Therefore the temperature of oil is kept low. The temperature of oil is generally kept at 150Â°C. Thinner is mixed bit by bit with constant stirring so that if goes on mixing and is not lost due to volatilization. With howsoever care varnish is prepared, it is not free from small particles of foreign matter present in resins. Sometimes such small pieces of resins are left, which being hard do not dissolve in varnish. Therefore, varnish is kept in big storage tanks for sometimes. When this unwanted matter settles down at the bottom, the varnish is filtered. The ratio of the gradient of varnish is generally kept for 60 lbs. 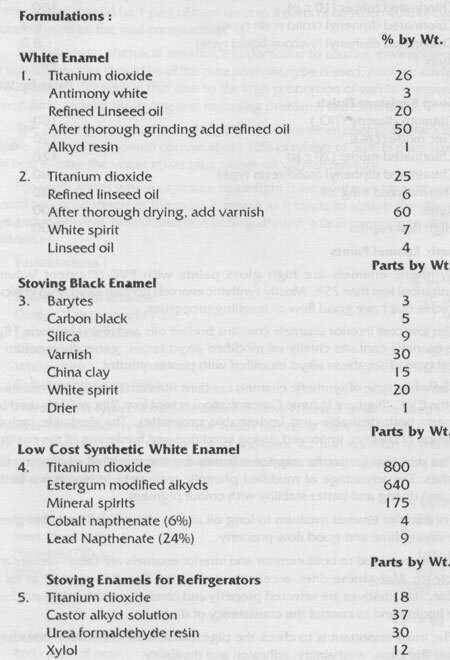 Of resin as shown in the above table because, generally kettles used for preparation of varnish. In these varnishes showy utility is much cared for. As these varnishes are applied on such articles which are kept inside the house and climatic or weather effects are also the minimum, therefore the quantity of resins can be increased so that the film is more lustrous, hard and quick drying. These varnishes are applied as undercoat on painted articles so that on keeping the surface of paint smooth, finishing varnish can be applied. It is not necessary for these varnishes to be durable. The main thing is that these should dry up quickly and their film should be such which could be made smooth by rubbing with pure stone or water-proof-glass-paper. In this varnishes hard resins are used and the quantity of oil is kept low (short oil). It is particularly hard and quick short oil varnish which is used on furniture instead of French polish. The characteristic of this varnish is that it is hot affected by hot water. For some special works such varnishes are required which are dull instead of ordinary lustrous varnishes. To produce this effect varnish is mixed with wax. Some other substances are also being used these days. These varnishes are prepared by the methods as those for ordinary oil varnishes, but in these different kinds of bitumens are used in place of resins, which are responsible for their black colours. As bitumens dissolve easily in oils, therefore these do not required "gum running" as in case of resins. Oil in first heated and then bitumen is dissolved in it bit by bit. Thereafter driers are added and lastly are diluted by the addition of thinners. In good quality of black varnish, besides bitumen a small amount of medium-hard resin is also mixed. 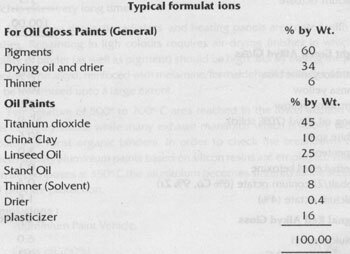 Here a number of formulas are being given for varnishes. As per requirements, proper adjustment in the ratio of different gradients can be done. But it must clearly be understood that the success of varnish preparation depends upon the proper cooking of the gradients rather than only knowing them. These varnishes are prepared by dissolving resins in volatile solvents. The solvent volatilizes and only the film of resin remains sticking on the surface of the article. The main difference between these and oil varnishes is that these dry up within minutes of their application. As lac is the main constituents of these varnishes, therefore these are generally termed lacquer also. In fact if these are termed as lacquers and the word varnish may be used for oil varnish only, it will be much appropriate. As lac is main constituent of these varnishes, therefore these are generally termed lacquer also. In fact if these are termed as lacquers and the word varnish may be used for oil varnish only, it will be much appropriate. It is very easy to prepare varnish of this category. Resin is broken up into small pieces and packed in the barrel and the solvent (like methylated spirit) is poured from above and the lid is closed. The barrel is kept rotating on its axle for about 2 hours so that the resin dissolves in the solvent. Thereafter, the lid is removed and varnish is taken out. It is filtered in muslin cloth or sieve and packed. If the varnish is to be prepared early, then the barrel should be double walled and boiling water is filled between the two walls. Sometimes a plasticizer is also mixed in these varnishes in small amounts so that the film of varnish maintains elasticity and its life is also increased. To prepare coloured varnishes soluble colours are mixed in spirit. 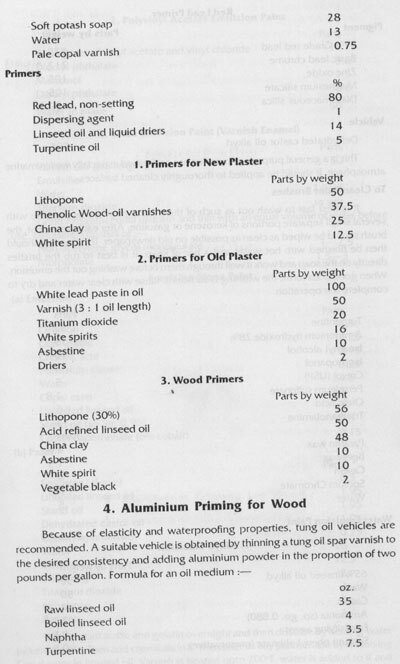 Below is given the list of things which are used in the preparation of these varnishes. Shellac Manila copal (soluble in spirit), Gum damar, Gum mastic, Sandarac, Colophony, Calcium Rosinate, Ester Gum, Synthetic resins. Methylated spirit, Wood napththa, Butyl alcohol, Amyl Alcohol, Turpentine oil and White spirit. Tricresyl phosphate, Dibutyl phthalate, Shellac wax, gum elemi, Copaiba, Camphor, Benzoin, Castor oil. The above list is not complete. These and many other gradients, mixed in different ratio, form hundreds of varieties of spirit varnishes. 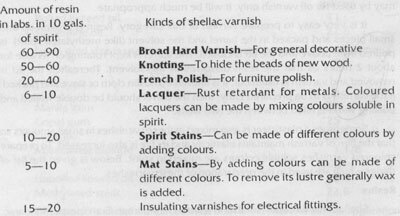 These spirit varnishes can be divided into two categories. Alcohol varnish and terpentine oil varnish. These varnishes mainly are, the solution of shellac in methylated spirit. As per the different ratio of lac and their utility, these are known by different names as given below. One defect of spirit varnish is that these are spoiled by water. To overcome this defect hard resins are used. Ti prepare varnish of clear colour bleached shellac is used. Plasticizers are also generally mixed in shellac varnishes so that the elasticity of their film can be increased. Number of years before the use of castor oil was rampant for this purpose but no plasticisers like dibutyl phthalate in place of castor oil in the ratio of 5-10% of the weight of shellac are added. Spirit varnishes dry very quickly and this quick drying property sometimes creates problems also, particularly when huge surfaces are to be varnished. In such cases, addition of 12-15% higher alcohols like butyl or amyl alcoholin place of spirit, help in comparatively late drying. In the recent years ethyl cellulose is being used in spirit varnishes. If the quantity of shellac is reduced and in its place 25% ethyl cellulose is added, the film of the varnish is hard and withstands wear out and there is little action of moisture also on it. Although turpentine oil is mixed alongwith methylated spirit, yet turpentine spirit varnish forms an independent category. As shellac does not dissolve in turpentine oil, therefore damar mastic and sandarac are mixed. 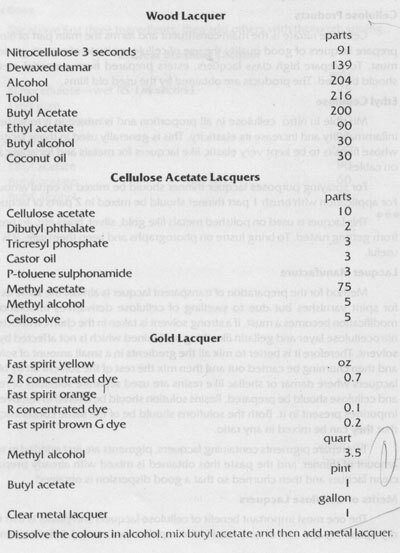 To lower its cost, some amount of colophony is added. Varnish obtained by adding approx. 6 lbs. Of damar in one gallon turpentine oil is generally known as crystal varnish which is used for wall papers and other decorative purposes. Mastic is also used in costly varnishes applied on maps-but for general purposes it is too costly. Mastic is soluble both in methylated spirit as well as turpentine oil. 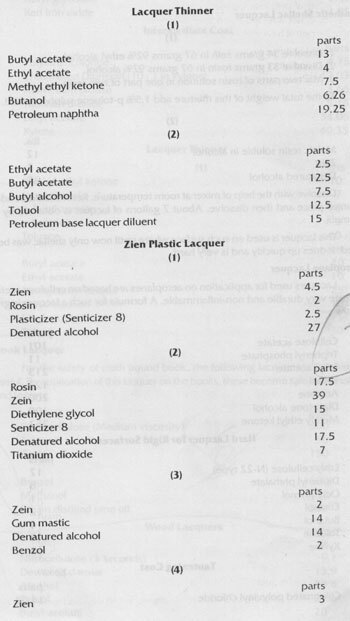 To prepare French varnish or French polish shellac and methylated spirit are mixed in the ratio of 1 to 5. After filtration this is packed in bottles or boxes. To make this varnish colourful, such substances are mixed in it which are soluble in spirit. Now a days the use of artificial resins is rampant in the preparation of varnishes and paints. 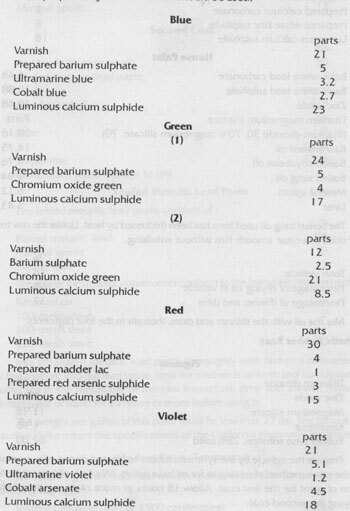 Here are given some of for formulas for varnishes made from synthetic resins. This varnish can withstand to the maximum extent the effect of water, chemicals, the sun and the weather. No doubt it is too costly than ordinary spar varnishes, but when once applied it remains as such for years together. Heat tung oil upto 330Â°F. Break beckalite into small pieces, add to half the quantity of oil and heat to 330Â°F	and then add the remaining half resin. Now heat slowly to 480Â°F and stir continuously so that resin dissolves in the oil. Now keep it at 480Â°F for about 20 minutes and then remove fire. Now add castor oil to it and also add immediately mineral spirit, and cobalt and lead driers, 55 gallons varnish will be obtained from this formula. Heat resin and linseed oil upto 580Â° F in an open kettle and keep it for about one hour. Now add tung oil into it and heat it upto 500Â°F and let it remain at this temperature for 5 mintues. Now add castor oil and litharge and heat 530Â° F. When 475Â°F and then add diluents. All last add driers to it. Total varnish obtained from this formula will be 58.5 gallons. In general paint manufacture which was considered simply a mixing operation decades ago has become a special branch of chemical industry. Now care is taken by employing latest techniques of process control, and industrial engineering to produce good quality of surface coatings at low cost and better durability. By adequate research and development on this field a new era has landed up in giving a wide range of special finishes. 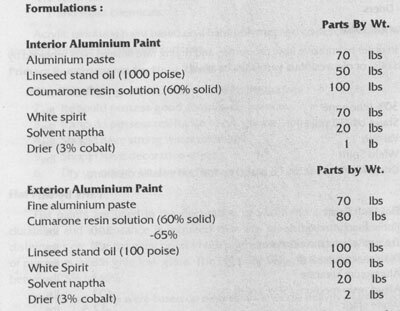 Preparation of the paste of suitable consistency with required quantity of pigment (Previously calculated) and media (premixing). Grinding the above paste in a grinding mill. (These are Ball Mill, Triple Roll Mill, Sand Mill, Dyno Mill, Centri Mill etc.). Thinning the paste to paint consistency with further medium or thinners. Tinting the batch to match the shade required. Checking the paint for physical performance required. It is very important operation in paint manufacturing. In the premixing operation the pigment and a part of the vehicle are mixed to form a paste in a mixer. The pigment are thoroughly dispersed in media before grinding. For a particular result the grinding time and number of passes through the mill are reduced. The proportion of pigment and the vehicle for pre-mixing is very important. If the pigment concentration increases, the paint will crumble and will not remain as a coherent mass. Only by careful charging and experimentation the suitable proportion can be determined. The mixers are arranged in a way that the pastes, when ready for grinding, can flow by help of gravity to the grinding unit. Commonly used machines for pre-mixing. It is advisable to add higher oil absorption pigments first, so that it has a longer mix. It is better to leave a little oil or varnish out of the mix until all pigment is in. It is important to cover the batch (for overnights) with little thinner and the mixer covered with lid. It is better to grind the paste from mixers on the same day because some pigments may cause combusion if ground next day. Pigments such as chrome green along with linseed oil if allowed to stand over night without grinding may cause fire hazards. The paste from mixers are then fed to a paint mil to disperse the pigment and the liquids intimately. In this paint mill each individual particle is wet thoroughly with vehicle and flocculated aggregates are eliminated. Ball Mill (Media of grinding Steel Balls). Pebble Mill (Media of grinding Pebbles). Sand Mill (Media of grinding Sands). The calculated amount of the paste must be charged to the ball mill keeping in view about the volume of balls, consistency and weight/volume ratio of pigment and vehicle. The light shades should not be ground in the ball mills because the shade may become dark. Sop it is advisable to carry the grinding operation in sand mill, or dyno mil etc. [liMore effective the wetting property of oils the greater the ratio of pigment to vehicle. Smaller the particle size of the pigment the lesser the ratio of pigment to vehicle. Greater the true specific gravity of the pigment the greater the ratio by weight of the pigment of the vehicle. The grinding operation is followed by thinning operation, also called reducing. The mill bases are high in pigment concentration which is reduced by the addition of thinning vehicles consisting of resin solutions, oils and solvents. The operation is basically a mixing operation carried by power driven paddles, propellers, or turbines. The paint of required formula is now produced and it should be tasted for grinding, consistency, colour, drying time and general apperance of the film. Turbines blade type mixers (used for low viscous batches). Care should be taken to add vehicles and solvents in proper sequence and render agitation to avoid "kickouts" of only partly compatible compounded ingredients. It is most important part of the manufacturing process. Inspite of extreme care taken in weighing the various colours used, shade variation do occur in different batches of the same product in series. Almost all batches of paint need some tinting or colour matching. Even white paints are tinted since there are many different shades of white. The colour matching is done in the same equipment used for thinning, with the same agitation to blend the tinting colours. The procedure must be handled by highly skilled or specialists who thoroughly understand the principles of shade matching. Tinting colours are to be grounded in vehicle which are compatible with the base products. Consistencies of the tinting paste is kept sufficiently thin, so that they may be easily mixed in the batch by proper agitation. The paint is passed through sieve preferably mechanical to remove skin and other extraneous matters. The most widely used refining process is based on vibrating rotating screens of desired mesh. Cheese cloth, Muslin can be used for other grades. The displacement type employs a plunger that is adjusted to discharge given volume. The gravity type operates by a counter weight which mechanically closes the discharge valve at the required weight. It is convenient operating and overhauling. It can be adjusted easily. It is ideal for filling small quantity paint containers. It can easily fill 800 to 1000 containers per hour. For better efficiency it is diserable to have lebelling machines which follow the filling machines in a line. Properly adjusted labeling machines produce a neat and more presentable package than hand labeling. The oldest types of gloss paint are those based on linseed oil. They are highly pigmented and usually contain only small quantity of thinner. Paint properties such as flow and leveling as well as film properties like flexibility hardness and durability are dependent largely on the nature and degree of pigmentation. In modern paints the film properties are controlled by polymer binders. In this oil based paint, oil acts as the binder and controls the film properties. The film property also depends on the net oil content and whether oil is drying or non-drying. In all types of paints containing drying oils, the essential drying after application to form a hard and insoluble protective or decorative coatings is mainly due to the chemical changes which takes place in the oil on exposure to the atmosphere. Excess of air to every part of film is necessary and it will be readily understood that to obtain uniform hardening, combined with complete obliteration of the surface, a series of thin coats are generally preferable to a single thick coat, for general decoration. It is the practice to apply to previously painted surfaces at least three coats of varying composition : priming, undercoating and finishing coat to enable adequate protective value along with decorative effect. In modern gloss finishes the drying oil are replaced by oleo resinous varnishes. These have harder films with improved gloss and gloss retention. 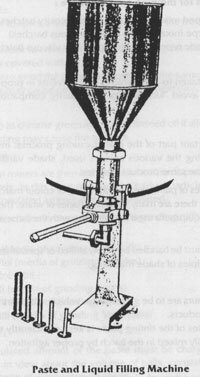 The earlier alkyds used were of the linseed/glycerol, and later linseed/pentaerythritol but due to many defects such as poor brushability etc. these were replaced by long oil pentaerythritol alkyds based on linoleic acid derived from soya bean or other semidrying oils. 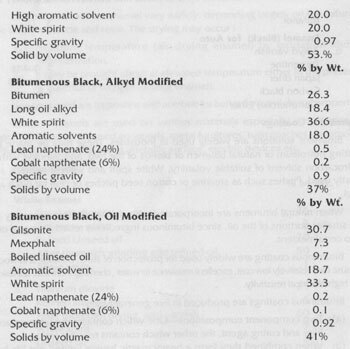 These alkyds show excellent brushing properties and very little tendency to yellowing on exposure to the environment. Oil gloss paints are not satisfactory to the decoration of surface such as radiators and heating panels, owing to yellowing of certain oil at high temperatures necessary. Paints can be made to stand temperatures upto 150Â°C without any colour change by pigmenting a short oil synthetic resin varnish. The melamine and urea resins are most satisfactory, but some varieties of alkyd and phenolic resin can be used for the decoration of radiators and heating panels. The formulation of heat resisting paints will naturally be influenced by both the temperature to which the films are likely to be exposed and the exposure time which is often very long time. More often domestic radiators and heating panels are coated with stoving finishes. Repainting in ligh colours requires air-drying finishes in which colour stability of binder (as well as pigment) should be high. Temperature of 600Â° to 700Â° C area reached in the lower section of some steel Chimney stalks, while many exhaust manifolds which is above the limit of stability of most organic binders. In order to check the breakdown of entire system usually aluminium paints based on silicon resins are employed. The silicone resin decomposes at 350Â°C the aluminium becomes sintered to the steel surface and provide protection. An oil based paint cannot be made absolutely fire proof. 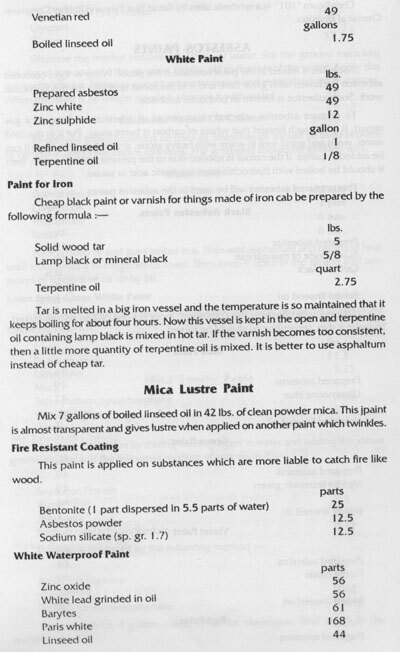 The paints prepared with a medium based on non-inflammable materials such as phenolics resins or chlorinated rubber have substantially reduced inflammability and a measure of fire resistance can be imparted to oil gloss or full gloss paints by the incorporation of fire-proofing materials such as borax, ammonium phosphate or magnesium phosphate. These flame retardant paints are designed to play dual role. Primary requirement is they must reduce of eliminate the spread of fire across the surface and secondary requirement they must be decorative. Several decades ago the paints used as flame retardant were based on alkali silicate solutions. Primarily they would not completely prevent damage or charring of combustible materials (substrates) such as wood as a result of excessive heat, they were effective in preventing the spread of fire. Sodium silicate was the cheapest of the alkalie silicates, but the efflorescence which developed spoiled the colour of the coating. Potassium silicate paints which don't have this draw back were used for stage scenery for many years. Oxygen barrier coatings (to eliminate oxygen, which supports Combustion). Intumescent coatings which produces a substantial layer of foam when exposed to fire and further retards it. These are thoroughly mixed with enough water to produce a perfect blend and render easy application on the surface. Uses : Any wood surface inside and outside buildings. Zinc and white lime are grounded together in oil, after which the Sodium Silicate is added, this addition being followed by the white lead and zinc sulphate. 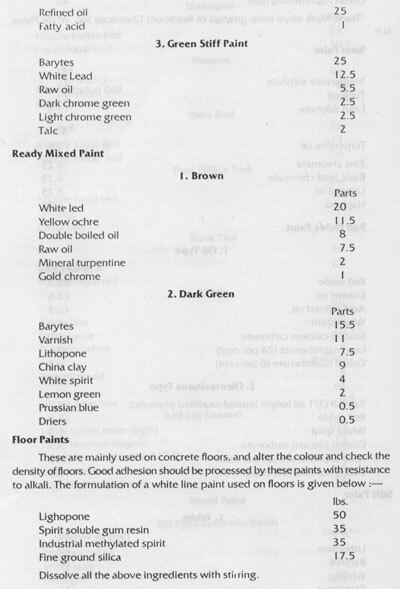 The white paint may be coloured to desired extent by incorporating desired coloured pigments. It is a mixture of plaster of paris, powdered glue, whiting and mica. It is marketed as dry powder and is mixed with water to a stiff paste which is then applied by scoop shaped tool with a short handle. It is finally given a heavy stripple. Plastic paint driers very hard but gives a smooth decorative finish for interior surfaces. The mixing is carried out in a heavy duty mixer. Protection of concrete from oils, grease and chemicals. The paint film must possess good adhesion and must be resistant to abrasion from pedestrian and light vehicles. Hard drying alkyds as media for wooden and mature concrete. Chlorinated rubber, suitably plasticized, can be used on both new and nature concrete. It is resistant to oils, greases and chemicals. It should possess resistance to oil, grease, and chemicals. Should have strong water resistance. Dry up quickly i.e. Drying time very less. Flat paints are used in the decoration of walls and ceilings where better durability and appearance is required than are given by using cement paint, distempes etc. The flat paint posses high pigment binder ratio, or by the addition of pigments which give low gloss. The Pigment Volume Concentration (PVC) is between 25% to 40%. The former types were based on oleoresinous media heavily pigmented with lithopone and containing aluminium stearate as an anti-setting agent. The new types consists of highly bodies alkyds of non-yellowing linoleic rich type pigmented with titanium dioxide and extenders at a P.V.C. of 50 to 60%. These modern or new types are more sensitive than the older or former types of oil finishes. 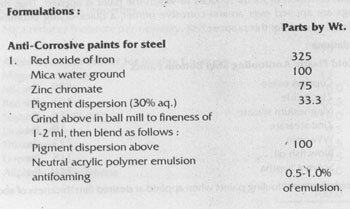 Formulations of flat paints require attention to a number of properties. The earliest types of flat paints were made by thinning down a paste in oil with minimum quantity of more oil to give the desired sheen. 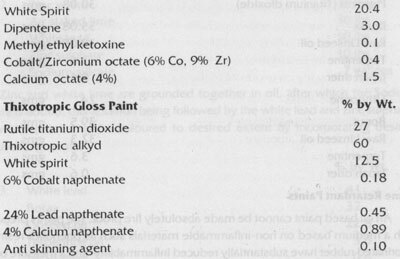 This type of paint is manufactured from metallic pigment, and therefore possesses unique properties. Ahigh degree of leafing is essential and this requires a medium of low viscosity, low acid value and high solids. The most favoured media are tung oil/coumarone tung oil/phenolics or urethane oil. Leafing is the ability of an metallic pigment to exibit a silvery appearance. More over the metallic pigment particles alien then-selves parallely with the coated surface. Moisture content should be below 0.1% as moisture reacts with flakes. Proper care should be taken during mixing. The choice of medium is governed by the environment to which the paint will be exposed and the nature of Substrate. For exterior work on wood maximum flexibility is desired and along oil medium should be employed. For exterior use on metal somewhat shorter oil length medium suffices, for inter metal surfaces still short oil varnishes may be employed. Aluminium paints are used on metal lamps-standards roof trusses, and other structural work. They are not recommended in buildings where inflammable solvents are used, since a spark can be generated if the surface of the paint is struck with a steel object. This is special type of novelty finish. Early types were made on tung oil oleorsinous varnishes to which a proportion of raw tung oil was often added, and the pattern was dependent on the gas checking of the tung oil medium in a foul oven in the presence of cobalt and manganese driers. The texture off wrinkles more or less depends on the thickness of the coat applied on the the surface. Modern types of wrinkles finishes are based on short oil alkyds of the linseed/tung or linseed/D.C.O. types. The nature of wrinkles depend on the pigmentation and the types of extender used. The texture of the wrinkle also depends on the temperature and becomes finer as the temperature rises. Wrinkle finishes of the above type are stoved for about 1 hour at 120Â°C. They are applied by spraying and can be stoved by a convertible type of oven. Driers are added to give 0.3% cobalt metal and 0.1% manganese metal on the resin solid. They are mainly used on instruments of various types and on typewriters. Major disadvantage is tendency of the pattern to collect dust. The surface of these finishes give the appearance of hammered metals. The hammered finishes mask the minor irregularities of the surface and at the same time produce a pleasing appearance. The hammer finishes can be produced either by using a carefully selected blends of solvents with a rapid drying medium such as short oil alkyds or by addition of silicone oils to a conventional type of stoving medium. Silicone oils are more or less responsible for developing this hammer type pattern. The hammer type of pattern can be obtained by dispersing small amount of non-leafing aluminium pigments in a fast setting vehicle with the proper solvent balance. Styrenated alkyds are commonly used. The hammer effect is given by small circular particles in which the flakes lie flat and reflect light back to the source. Solicone oils designed specifically to give hammer effect the added in minute quantity. The amount is critical, the size of the pattern varying inversely with amount of silicone oil used. Too much silicone oil leads to cissing a type of defect. This defect is discussed later. Method of application is by spray at higher viscosities than used with conventional coating so as to minimize sagging on vertical surfaces and other flat surfaces. Coloured hammer finishes are produced by addition of conventional stains to the above base systm. The quantity of stainer required is very minute. Uses : Hammer finishes are used extensively on instruments, metal surfaces, typewriters, office furniture and sheet metal work. The advantage of hammer finish over wrinkle finish is that they do not collect dirt to the same degree as wrinkle finishes. A marine coating is by definition any coating used on marine equipments. In a marine environment there is a need for many types of coatings for varied applications. Due to the harshness of this environment, the greatest demand is for anti-corrosive type coatings. Therefore most marine coatings are designed essentially to assist in the prevention of corrosion. 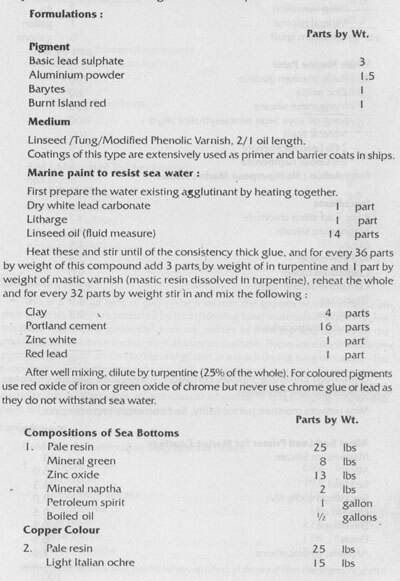 Paints used for off-shore structures. The desired properties required in paints for the various parts of ship depends on the location of the areas to be protected and it is used to designate the paints by these areas, i.e. super structures, top side, boot top and so on. The superstructure includes the fixtures above the deck surface. Conditions of exposure are extreme. Temperature fluctuations can be considerable, and rain, shalt spray and at times, intense sunlight are encountered and the coatings is formulated taking into consideration all these factors. The outer surface of the hull is sub divided into three parts. Boot top-the area which is exposed when the ship is empty but immersed when loaded. Now-a-days alkyds are used instead of oleoresinous media in top side paints. The basic requirements are good weather resistance, and ability to withstand intermittent soaking and buffering by waves. Long life finishes which can with stand severe conditions are based on chlorinated rubber or vinyl resins. The boot top area is that area which is exposed to the atmosphere when the ship is empty but immersed when laden. This area is the most difficult to maintain in good condition. The boot topping paint should with stand the 'pH' of sea water (8 to 8.5) and also resist the ultraviolet rays, wind and salt spray. Good chemical resistance and fouling. The resins found suitable are epoxy, chlorinated rubber, polyurethane, and vinyl resins. To resist the fouling, toxins are incorporated. This is a special type of paint which retards the growth of marine fauna on ship-bottoms. They are prepared by incorporating toxic materials in a quick drying medium. 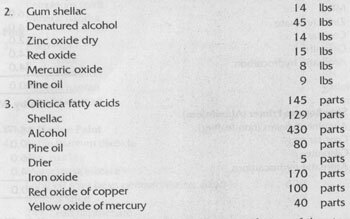 The toxins generally used are oxides of mercury and copper or the metallic soaps of these metals such as copper rosinate. These are mixed with inert pigment, generally an iron oxide and gound in a quick drying tung oil varnish. 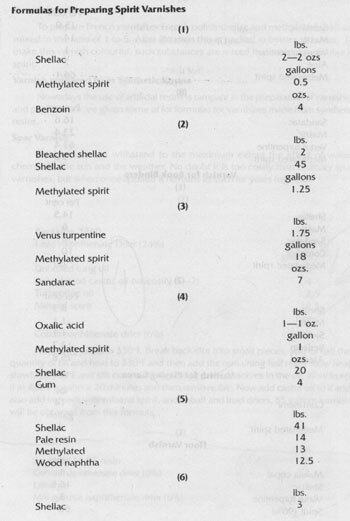 The proportion of toxic ingredients are 1 lb to a gallon of material. These coatings promote corrosion of metal surfaces to which the paint is applied. Thus these coatings are applied over an anti-corrosive primer, a quick-drying bituminous paint is being used for this purpose. Cold plastic antifouling paints when applied at desired film thickness of about 6 mils, given fair protection for about a year in normal service. They are used over varnish type anti-corrosive primers as they frequently promote corrosion. Shellac is dissolved in alcohol prior to manufacture of three types of paints. These paints are widely used to prevent corrosion. The corrosion paints consists of special corrosion inhibiting pigments and the binders are materials such as drying oil, varnishes, alkyds and epoxies. Bituminous materials play important role in inhibiting corrosion. They play dual role all designed to provide a protective barrier between the surface to be protected and the element which promote corrosion. They utilize two different methods of protection. Clear coatings and those based on bituminous materials protect essentially by providing a barrier coat which is sufficient thickness, and resistance to service conditions to prevent the corroding environment from reacting the surface to be protected. 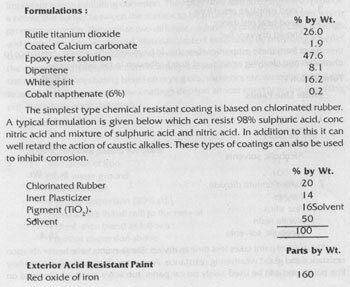 However corrosion resistance coating based on drying oils, varnishes etc. are quite permeable to water and oxygen and these coatings depend almost entirely on the inhibiting pigments to control corrosion. 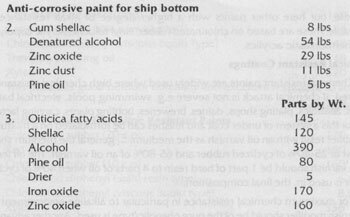 The anti-corrosive paints are used with anti-fouling paints for ship bottoms. These are used on concrete and asphalt roads, surface of car parks, aerodrome runways, and industries. For asphalt surfaces the paints are based on resin soluble in alcoholic solvents. Manila resin dissolved in industrial methylated spirity is widely used, suitably pigmented to give maximum abrasion resistance. A part from these properties they should have better toughness, resistance to chemicals and cleaning agents, and good adhesion to the substrated. This type of paint takes less time to dry up. These paints have better abrasion resistance and good weathering resistance. Above two formulations are of white line paints and can be used safely on car parks, run ways etc. 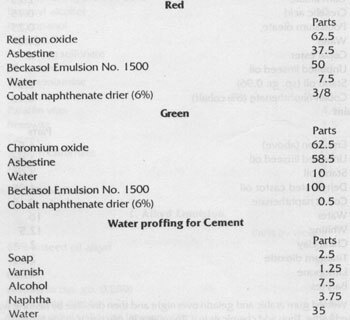 It can be used on concrete, but here other paints with a higher degree of alkali resistance are preferable. These are based on chlorinated rubber, vinyl toluene/acrylic copolymer and thermoplastic acrylics. 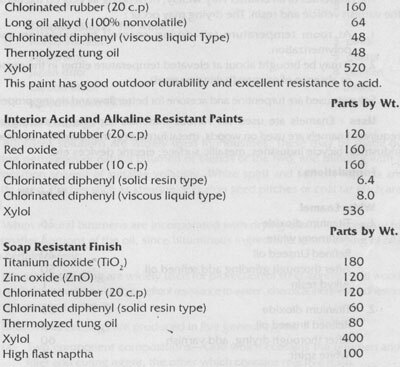 Chemical resistant paints are widely used where high chemical resistance is required. If chemical attack is not severe e.g. swimming pools, electrical battery rooms, abattoics, plating shops, dairies, breweries, bottling plants, canning factories etc. For this a system of under coat and finishes can be formulated on a mixture of the rubber resin with an oil varnish as the medium. 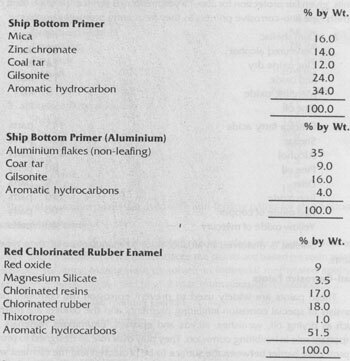 In general the medium should consist of 25-40% of cyclized rubber and 65-80% of an oil varnish. 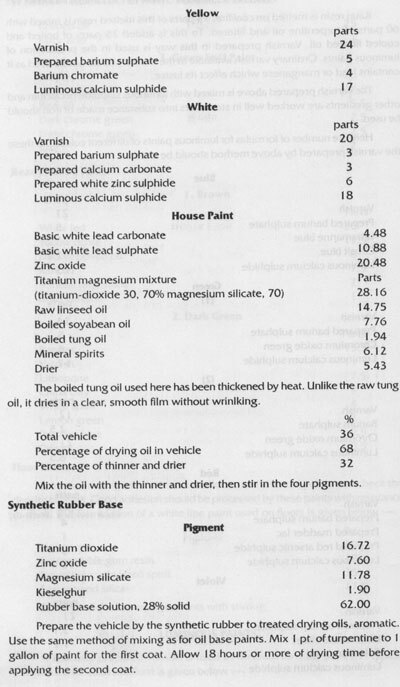 The oil length of the varnish should be 1 part of hard resin to 4 parts of oil when 40% of cyclized rubber is used in, the final composition. 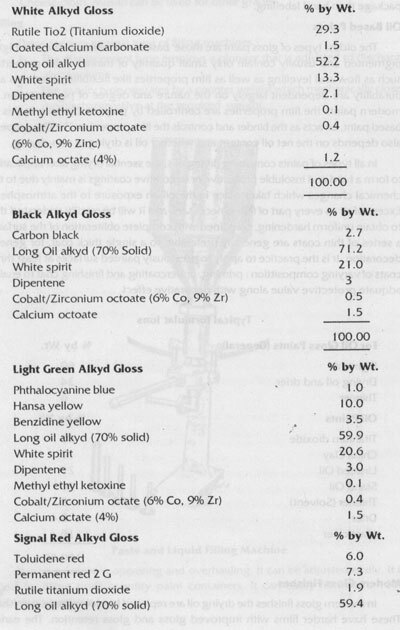 For maximum chemical resistance in particular to alkaline environment, the oil varnish modifier should be of the pure phenolic/type is used, Another advantage of mixtures of this type is that due to the high proportion of varnish present, the film is oxidized during drying and recoating problems are eliminated. The finishing coat must contain cyclized rubber when chemical attack is very severe. The top coat should contain about 70% of rubber to 30% of plasticizer but it is best to base the under coats on a rubber-oil varnish mixture. For applications where exposure to sunlight is encountered titanium dioxide should be encountered as the main pigment as it tends to absorb the ultraviolet rays and to prevent breakdown due to degradation, a fault common to all rubber derivatives. Synthetic enamels are high gloss paints with PVC (Pigment Volume concentration less than 25%. Mostly synthetic enamels contain alkyd resin vehicles or vehicles that have good flow or leveling properties. The low cost interior enamels contains titanium dioxide, for maximum gloss the P.V.C. (Pigment Volume Concentration) is kept low. 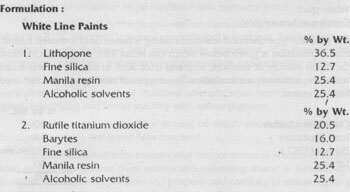 Zinc oxide is used but it imparts both desirable and undesirable properties. The desirable include absorption of UV rays, improved drying condition and hardening of the coating. The principal binder for interior enamels are the modified phenolic resin varnishes. The advantage of modified phenolic resin vehicle is it has better gloss, fast drying and better stability with colour pigment. For exterior enamel medium to long oil alkyd, which have excellent gloss, better drying time and good flow property. The drier added to both exterior and interior enamels are cobalt oleates and lead oleate. Manganese drier, accelerates yellowing thus it is avoided as for as possible. The additives are selected properly and carefully to obtain higher gloss, better linding and to control the consistency of the paint. The most important is to check the pigment volume contention because it controls the gloss, washability, adhesion and durability. At room temperature (air drying enamel) by oxidation and/or polymerization. It may be brought about at elevated temperature either in presence or absence of oxygen (baking enamel). 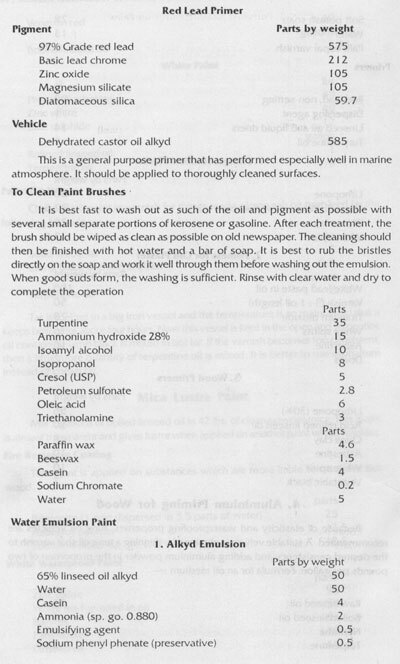 Solvents used are turpentine and acetone for better flow and drying properties. 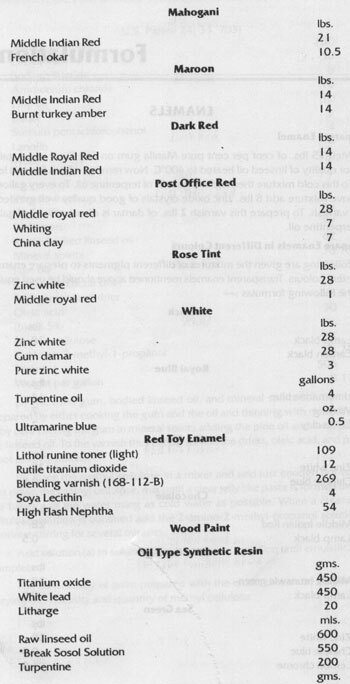 Uses : Enamels are used on various materials especially where gloss is required. Enamels are used on woods, metal furnitures, train coaches, automobile industries, bicycle industries, metallic surface, electric devices etc. Bitumens solutions are widely used in industries. These may be made by melting petroleum or natural bitumen or blends of the two, and thinning with a hydrocarbon solvent of suitable volatility. 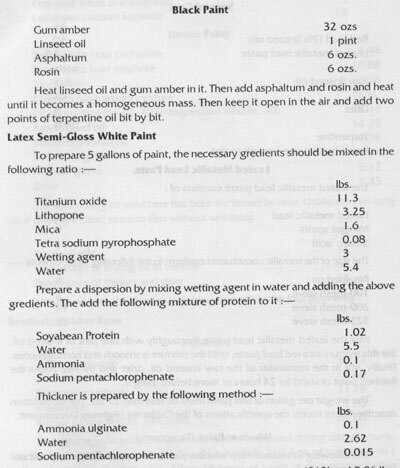 White spirit and solvent napthas are mostly used. Pitches such as stearine or cotton seed pitches or coal tar pitch are used. 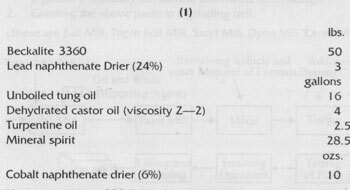 When natural bitumens are incorporated with drying oils, it is necessary to use smaller portions of the oil, since bituminous ingredients retard drying of oils upto certain extent. Bituminous coating are widely used for protection of steel, concrete and wood because their relatively low cost, excellent resistance to water, chemical inertness, adhesion and high electrical resistivity. Bituminous coatings are produced in five general types. Two component compositions-One which contains the bitumen and filler and curing agent, the other which contains reactive resin. When combined they form a heavy mastic having limited pot life but cures on application to a thorough setting bituminous coating. Bitumen solutions (solvents) without fillers and applied cold. Bitumens and fillers, (also called mastic) applied by pressure spraying. On exposure to weather, bitumen films undergo surface oxidatior, and hardening, while the underlying materials remain soft. The weather resistance is improved by the introduction of drying oil, and still further improvement is conferred by long oil alkyds. New trend in the paint industry is high solid coatings. This high solid coatings reduces or eliminates the use of solvents along with the problem of air pollution. These coatings may be 100% solids, and they are applied as liquids. The binder must be used in solution because there is an insufficient volume of solvent to separate the particles of binder. The polymer must be of low moldecular weight to meet viscosity requirements and must be applied in enamel form. Epoxy resins are available in liquid form at relatively low viscosity which can readily be used to formulate solventless or high soild coatings. Most formulations of this type have very short pot life after curing agent is added. Low viscosity liquid epoxy resin when blended with low viscosity hardener, it forms a stable coating which do not shrink even on drying. It eliminates the fire hazard and a high degree of protections is there by achieved. The two component application system consists of two separate supply pots one for epoxy resin and one for curing agent. The two components are mixed in a mixing chamber wherein the two components are rapidly and thoroughly blended in a precise ratio. These coating are used for industrial flooring, tank lining, hopper care lining, high glaze wall coating and a lining for concrete electrolyte cells in a nickel refining process. Ketimines are new types of curing agent which is used in high solid coatings. For dry conditions also ketimine reacts with epoxy slowly but in presence of water. Ketimine releases polyamine to cure the epoxy resin in the usual manner. The polyamine epoxy coatings make it possible to apply a thick film in one coat. 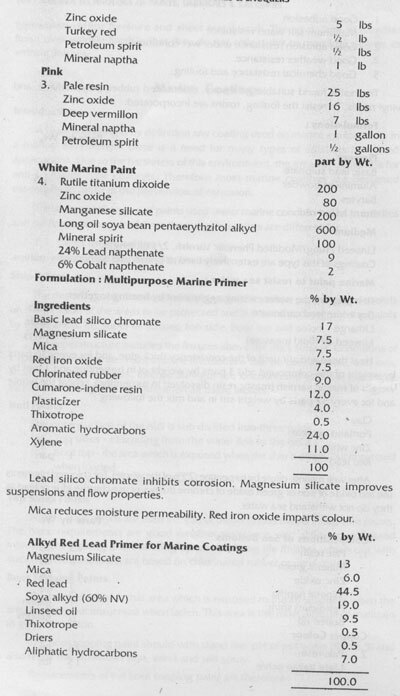 Since there is no solvent releases the pigmentations is added with the polyamine portion. When thick coats are applied to vertical surfaces, the pigmentation helps to prevent sagging but it is more often required to add anti-sagging agent. Graphite occurs in nature as a grayish black, lustrous mineral. The grades vary in carbon content from high 98 per cent to low 40 per cent. The impurities present are quartz, calcite one silicate minerals. Graphite is a form of carbon intermediates in structures between the amorphous black and the Crystalline diamond, consisting of small hexagonal crystalline plates. 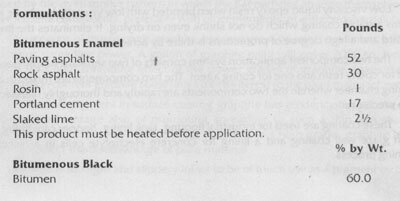 Graphite is otherwise called black lead or plum bago. The preparation of graphite consists mainly in selecting the minerals and grinding in water. The grinding is slow and tendious process, owint to the lubricating properties of the material and its flaky structure. The low grade graphites, containing a large proportion of associated minerals undergo a further preparatory treatment with dilute and concentrated acids, in order to extract as much as possible of this inert material. The chief impurities in natural flaky graphites are mica, calcite quartz, felspar, iron sulphide, and silicates of calcium, magnesium and alminium. Properties : Graphite consists of plate like particles which are very soft and have specific gravity 2.1 to 2.3. Its inertness to light, heat and most chemicals together with resistance it offers in a surface coating to the penetration of water caused by the overlapping pattern in which the flat particles arrange themselves make it useful constituents, preferably with other pigments, of anti corrosive paints. On account of its structure graphite posses great opacity, combined with enormous spreading power. A gallon of graphite paint will cover 2000 sq. It of surface. This high spreading effect of the power grades of graphite makes the lower carbon content graphite some times more interest to the paint manufacturer. As the sole pigment in surface coating graphite has tendency to flocculate and the disadvantage also of promoting spreading to such a thin film that protection deteriorates. In practice Silica is added to a high grade graphite in order to correct the disadvantage of pure material. Graphite is too light and slippery infact to be of much use as a pigment by it self. Excellent moisture resistance due to its structure. Graphite is used in manufacturing of aluminium and bronze paints and essential ingredient of all brown and black paints. When grounded in oil graphite tends to coagulate and settle out. This has been overcome by treating graphite by various organic substances such as tannic acid (tannin) to make it deflocculated graphite. Natural graphite and electro-graphite (which contains 98% carbon) or artificial graphite are used as pigment in surface coatings. Due to weak bonding forces between the layers, the layers separate out readily to form flakes. The formation of flakes is essential in the good lubricating properties of graphite and in its behaviour in surface coatings. Graphite paints are not used for its colour value but for mechanical and chemical properties it imparts to the coating. Graphite flakes tends to overlap and reinforce the film against mechanical and chemical properties it imparts to the coatings. Graphite flakes tends to overlap and reinforce the film against mechanical stress and penetration of moisture and gases. In addition to this graphite paints have excellent resistance to common acids, alkalies and gases abundantly found in industrial atmosphere. Graphite increases brushing characterstics of paints and graphite should be used along with corrosion inhibiting pigments such as red lead or Zinc yellow since it does not have anti-corrosive properties. Uses : Graphite finds variety of industrial application by virtue of its unique physical properties, It is used in manufacture of electrodes, plate, and brush required in electrical industry. It possess high thermal conductivity, excellent mechanical strength, high resistance to thermal shock. IT is therefore well suited for crucibles, heat exchangers, furnace, electrodes and furnace articles. Due to low coefficient of friction it is adapted for bearing, and brushes. It is inertness to chemical action over wide range of temperatures. Thus it is extensively used in electro chemical industry. Flaky graphite and vein graphite is used in production of graphite crucibles, retorts, muffles, saggers, pourings, nozzles, and other articles where resistant to high temperature is primary requirement. Graphite is also used in the manufacture of different types of brushes. The graphite for brushes should contain less than 2-3 ash. Graphite is also employed in the manufacture of plates, dises, roads and plungers. Grapite prevents scale formation in boilers. It is not affected by acidity or alkalinity of boiler feed water or by temperature. All variety of graphite are used in foundry facings. Graphite prevents mould sand from adhering to cast articles. High grade graphite is particularly used. Dry graphite is employed as lubricant for steam cylinders for heavy bearings, graphite is mixed with grease and for light bearings mixed with oil. Graphite is used for polishing stones and other cast iron articles. Blasting powders and heavy ordinate powder are glazed with graphite for protection againt damp.